U.S. President and Japanese PM agree on the need to completely dismantle North Korea's nuclear weapons and ballistic missile program. 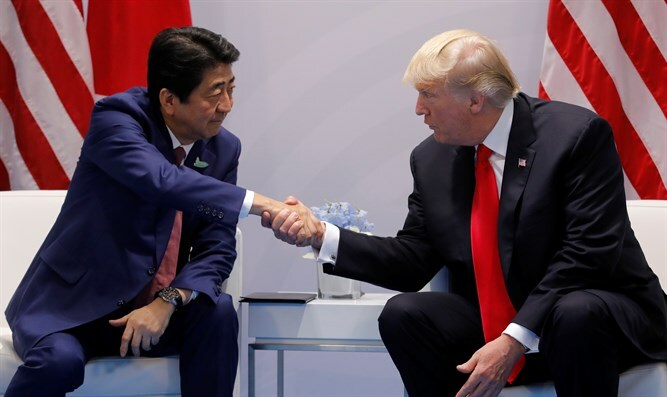 U.S. President Donald Trump and Japanese Prime Minister Shinzo Abe agreed on Monday that it is "imperative" to completely dismantle North Korea's nuclear weapons and ballistic missile program, the White House said, according to AFP. The two leaders will meet ahead of a much anticipated summit with North Korea's Kim Jong Un which is back on schedule for June 12 in Singapore just days after Trump announced he was canceling it. The American president said on Friday the summit could go ahead as planned following a more appeasing statement from Pyongyang and productive talks with North Korean officials. On Sunday, an American team began talks with North Korean officials to prepare a possible meeting between Trump and Kim. Japan, which has by far the hardest line compared to neighbors China and South Korea, has been left uneasy by the pace of events, and by what it sees as an unwarranted softening toward an untrustworthy Pyongyang. Abe and Trump spoke by telephone a day after the American and North Korean officials met at a border truce village to prepare for the summit. During a telephone call, the pair "discussed recent developments in North Korea and confirmed they would meet again to continue close coordination in advance of the expected meeting between the United States and North Korea," a White House statement read, according to AFP. "The president and prime minister affirmed the shared imperative of achieving the complete and permanent dismantlement of North Korea's nuclear, chemical and biological weapons and ballistic missile programs," it added. U.S. officials recently said that North Korea had directly confirmed that Kim was willing to negotiate about potential denuclearization. Kim later announced himself that his country would close its nuclear test site and suspend long-range missile tests.